Are you a fan of Google Assistant? Do you say things like, “OK Google, pass the salt!” at the dinner table? Have you asked Google Assistant random questions to see what it would say in reply? 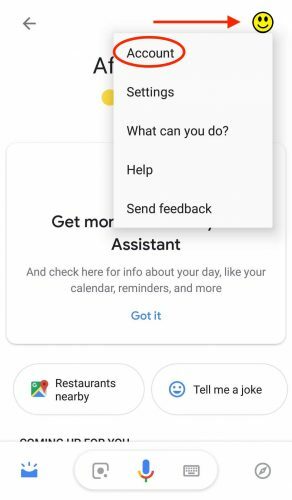 Google Assistant is a voice assistant from Google found on mobile devices, Google Home, and more. It allows users to perform tasks and get information in a hands-free fashion via a Voice User Interface, or VUI. 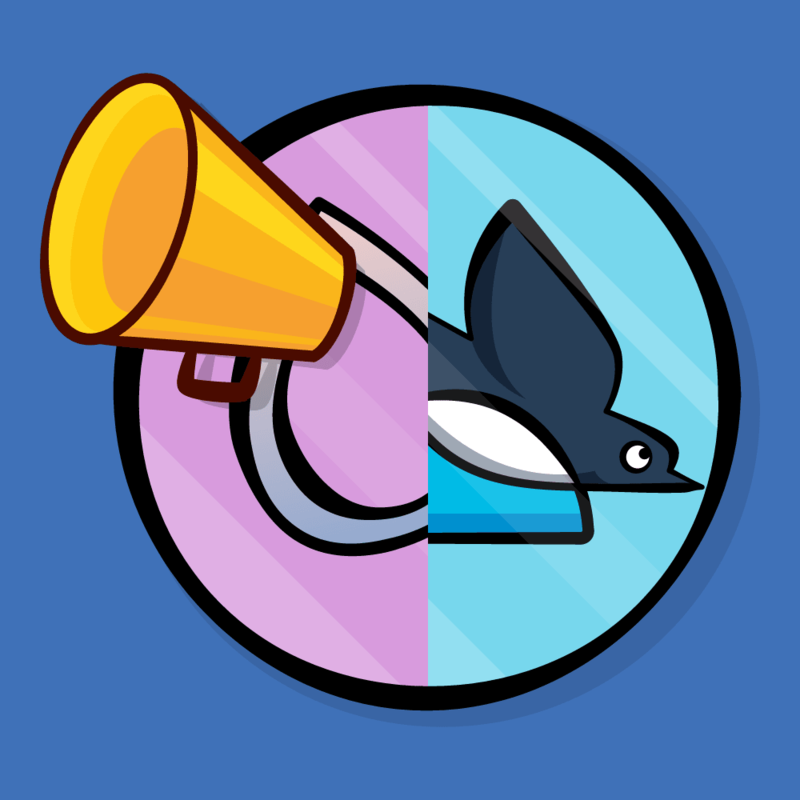 It allows users another way to interact with your brand other than your Android app. Google Assistant is on more than 500 million devices worldwide, and Google expects that number to reach one billion soon. 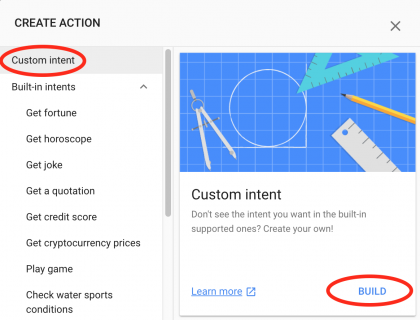 Did you know you can write your own actions for Google Assistant? 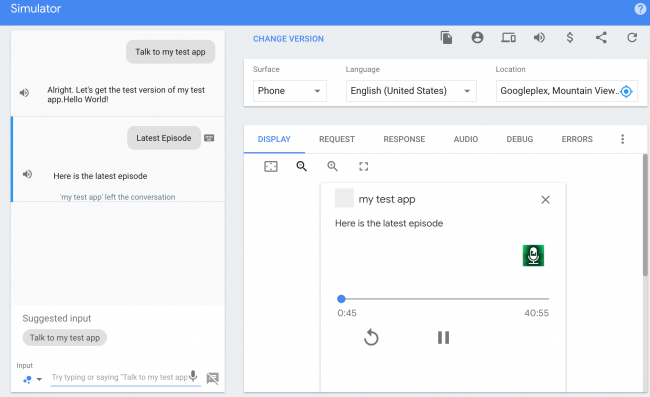 In this tutorial, you’ll learn how to create your own conversational experience with Google Assistant. Is VUI an appropriate means of accomplishing the task the action creates? Here’s a quiz to help you determine whether VUI is a good fit. Who is the audience for this action? A Happy Path, or the shortest path through the conversation that accomplishes the task. Conversation repair scenarios that allow the conversation to recover and continue in cases where the user says something unexpected or the user is not properly understood. Opportunities for the user to exit the conversation gracefully. Varied greetings when starting the action to keep the experience new and spontaneous for the user. Get the projects by clicking the Download Materials button at the top or bottom of this tutorial. In this tutorial you’ll write an action to play the raywenderlich.com Podcast right from the assistant!. 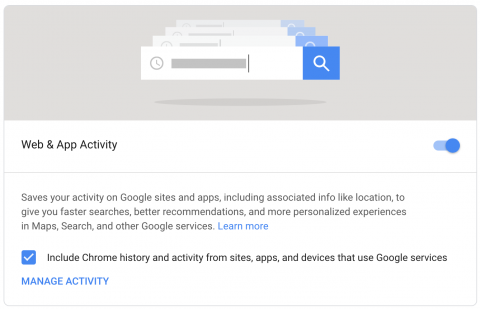 An active Google account. Sign up for one here. 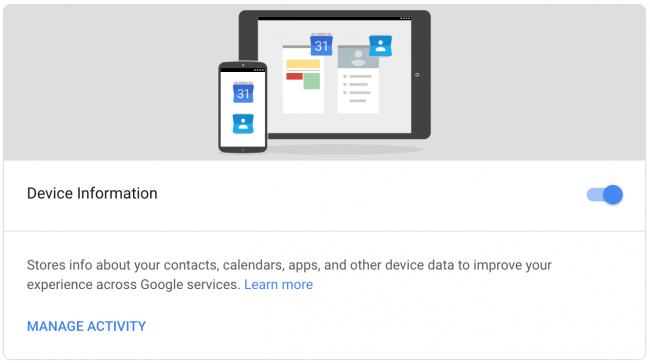 An Android phone/tablet logged in with the same Google account that you’ll use in this tutorial. Note: It is helpful, but not required to have some understanding of Node, NPM, and Promises. This will take you to the Dialogflow console webpage. If prompted, select or login with your Google account, and click Allow. You might also need to accept terms of service. Next, create your agent. 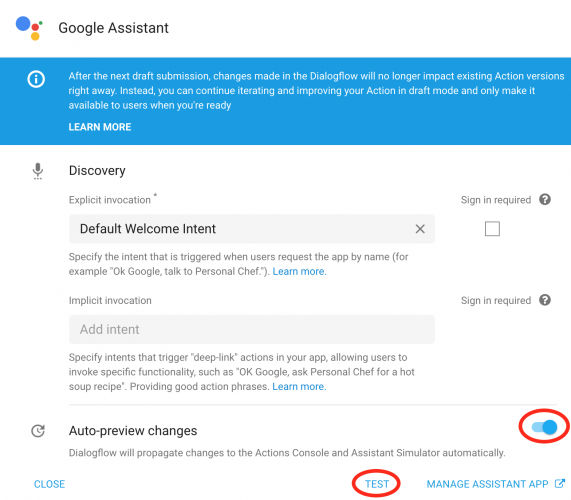 The Dialogflow page will prompt you to create an auto-configured Dialogflow agent. Click Create. Agents are Natural Language Understanding (NLU) modules. Agents translate what the user says into actionable data. When the utterance of the user matches one of the agent’s intents, the agent performs the translation of the user’s request into actionable data and returns the result to the user. Define examples of user utterances that can trigger the intent. Specify what to extract from the utterance. Generally, an intent represents a single ‘turn’ in the conversation. Name: An identifier for the intent that reference by the fulfillment. Training Phrases: A defined collection of example phrases that invoke a particular intent. 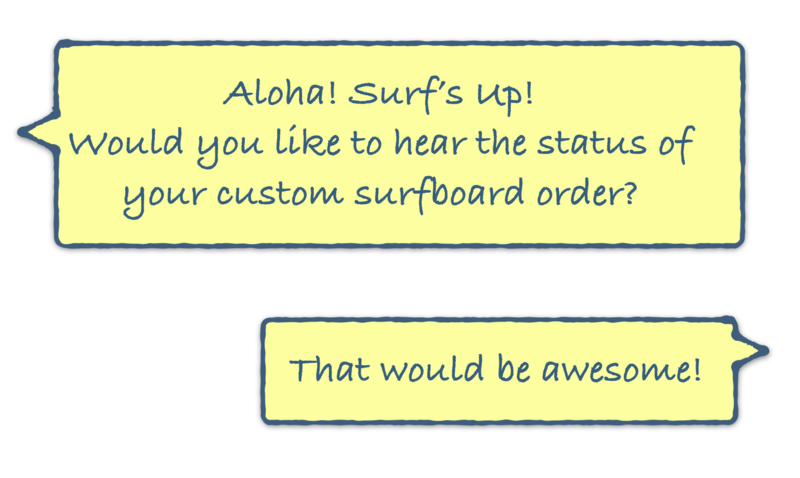 Dialogflow will automatically match similar phrases with the ones provided. Actions and Parameters: Define which parts of the user utterances to extract. These often include information such as dates, times, quantities and places. Response: The utterance displayed or spoken back to the user. Note: Dialogflow supports a feature related to intents called contexts. Contexts are used to have more control over intent matching and manage the state of the conversation over multiple intents. To learn more, check the documentation. A typical agent has several intents that address different user intentions. When a Dialogflow agent hears an utterance from the user, it attempts to match that utterance to one of the training phrases defined in the intents. Then, the agent returns the response from that intent. There are special types of intents. By default, a new agent includes two of these, fallback intent and the the welcome intent. The agent invokes a fallback intent when the user says something that the agent can’t recognize. 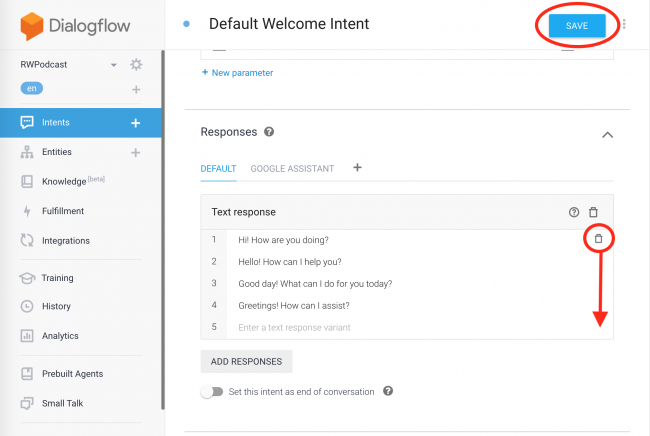 The agent invokes a welcome intent when the user starts a conversation with the agent. 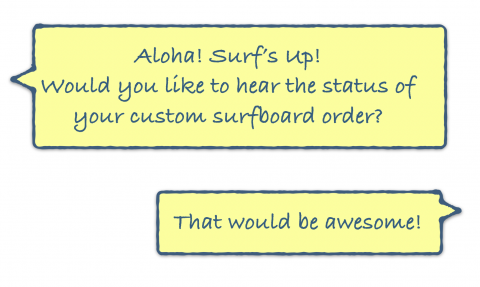 The welcome intent informs the user what the action does or how to start a conversation. You can also create custom intents, choose your own training phrases and define your own responses. Lastly, there are follow-up intents. Follow-up intents nest below a parent intent. Use them to gather follow-up information. Another tab will open. 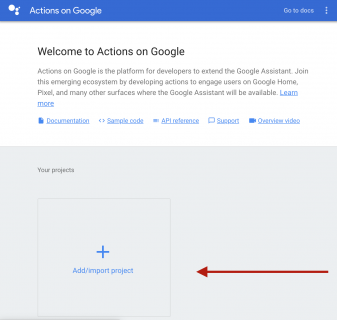 When Dialogflow finishes Updating the Action in the Actions on Google Console, you’ll see the action loaded in the Actions Simulator. The default welcome and fallback intents are operational. To see what I mean, have a conversation with your action! 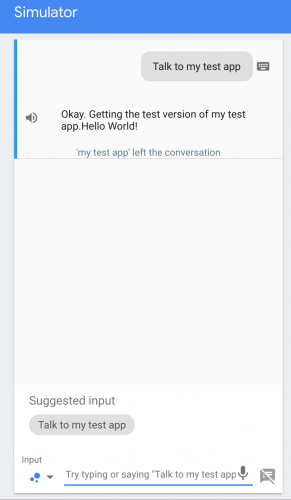 Select the Talk to my Test App Suggestion Chip to begin. You’ll see a friendly greeting randomly selected from the list of responses each time the action runs. Time to try adding your first custom response! Return to the Dialogflow web browser tab. Select Intents ▸ Default Welcome Intent and scroll to the Responses section. Now, add your own responses. Make sure you click Save when you’re done! Finally, click Integrations ▸ Integration Settings ▸ Test to run the action. Click the Suggestion Chips to Talk to my test app and Cancel a few times to see how the action randomly chooses between the custom welcome intent responses. 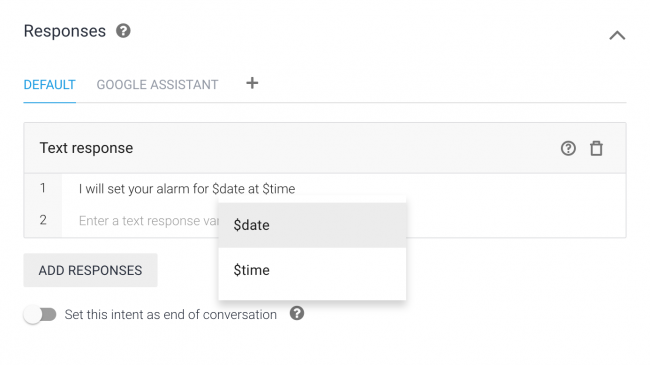 In addition to the Simulator, Google Assistant allows you to run your action on a device. Open Google Assistant on most Android devices by long pressing home. 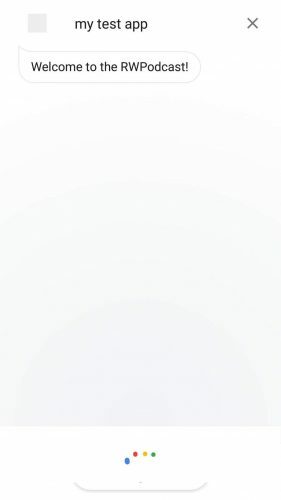 Swipe up on the Assistant to open it. 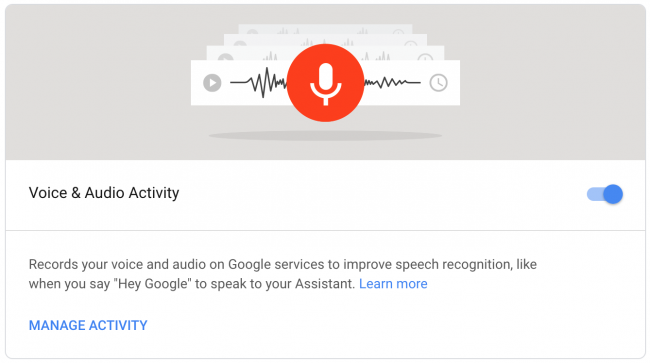 Note: This guide explains how to use Google Assistant on different platforms including iOS. Make sure the Assistant is logged in with the account you’re using for development. To change accounts, click your account avatar in the top right corner. Then, click Account and select the appropriate account. If the development account isn’t on your device, add it through the device settings and try again. Note: Make sure your phone locate is set to English (US) to find your app. 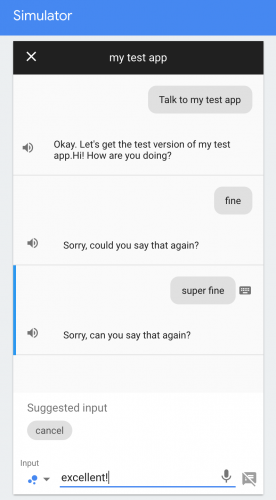 By typing or speaking, tell Google Assistant to Talk to my test app. 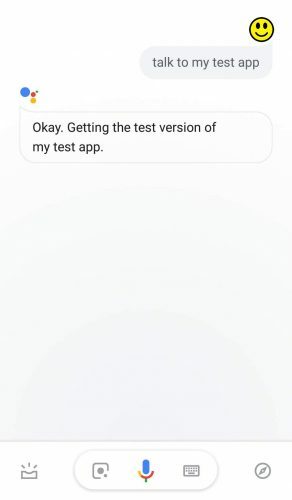 Google Assistant will run your test action. 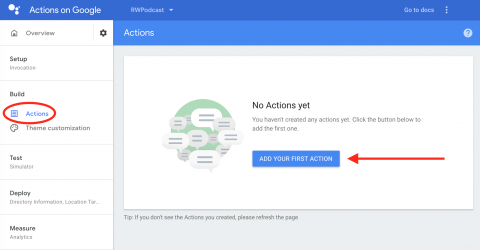 Now that you’ve modified your welcome intent and tested your action, you need to upload the Dialogflow project from the starter project to start developing your own intents. Keep reading to learn how! To upload the preconfigured agent in the sample project, select Gear Icon ▸ Export and Import ▸ Restore From Zip. Drag and drop to attach or browse to the file RWPodcast.zip from the starter materials for this tutorial. If you haven’t downloaded them yet, you can download them using the Download Materials button at the top or bottom of this tutorial. 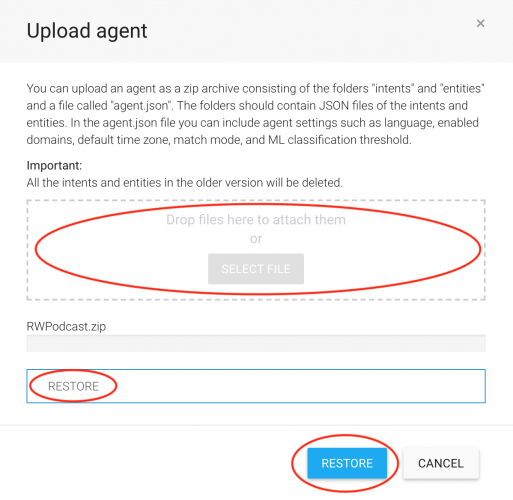 Then, type RESTORE in the appropriate text box and click Restore. After it uploads, click Done. Now that you know how to get started building a Dialogflow agent, it’s time to learn how to fulfill more complicated user natural language requests by developing Fulfillment. 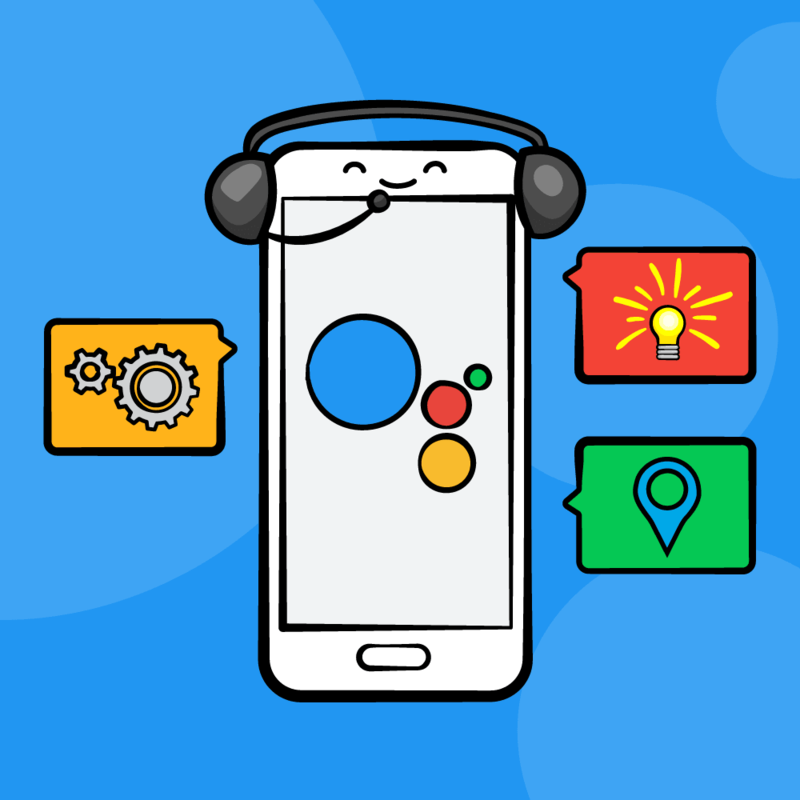 Fulfillment for Google Assistant is code deployed as a webhook. Each intent in the agent has corresponding business logic in the webhook. Information extracted by the agent can generate dynamic responses or trigger actions on the back end. Most actions require fulfillment to extend an agent’s capabilities and perform tasks such as returning information from a database, implementing game logic or placing orders for the customer. You can implement a simple webhook inside Dialogflow by utilizing the Inline Editor. More complicated actions benefit from a different approach. Due to limitations of the Inline Editor, it’s best to do development for the webhooks locally. To do so, set up the required libraries with NPM. Note: NPM typically comes with Node.js. You can find instructions for how to install both here. Note: If the install doesn’t work, you may have to change the NPM permissions. Find more information here. A web browser will launch for authorization. Login with the Google account that you’re using for development. Allow the required permissions. You’re ready for the next steps! 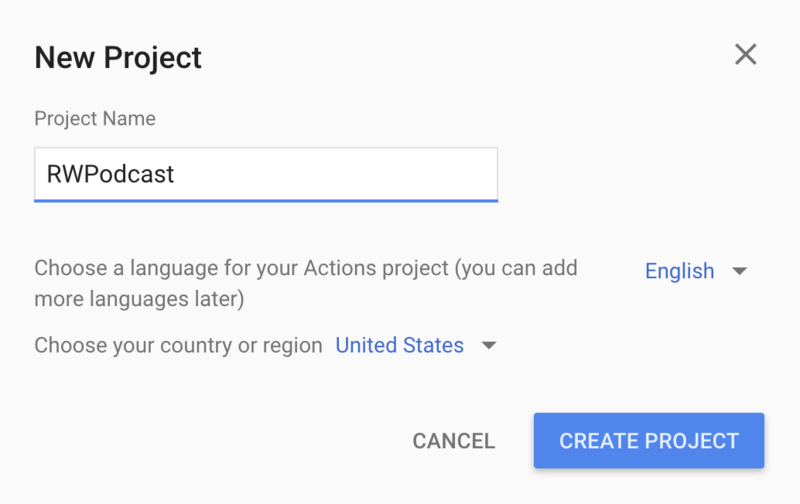 First, find your project’s ID in Dialogflow by selecting gear icon ▸ General ▸ Google Project Section ▸ Project ID. Retain this project ID for the next step. This command tells the Firebase CLI which project is currently selected in the terminal. This command installs the NPM modules. 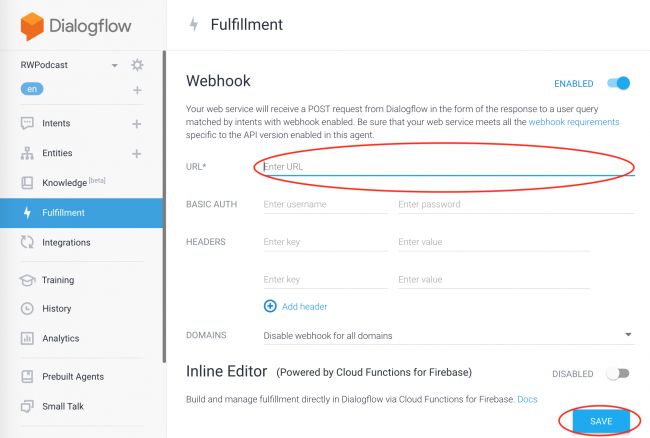 In Dialogflow under the Fulfillment tab, enable the Webhook and enter the URL copied in the last step. Finally, click Save. 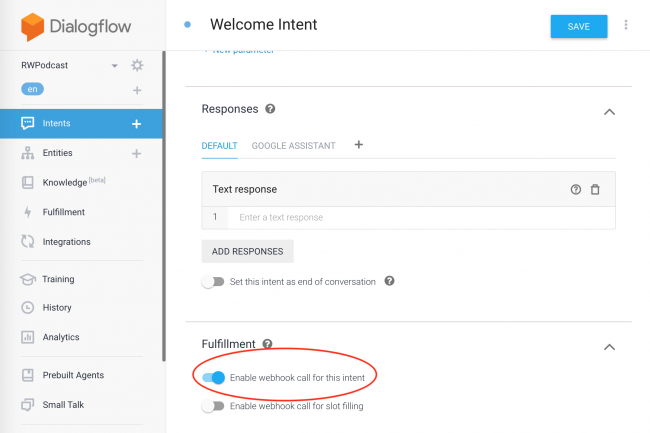 Open the Welcome Intent again under Intents and notice that under the Fulfillment section the Webhook is enabled. Now you’ve set up your local development environment. Each time you make changes in the index.js file, save the file and run the command firebase deploy --only functions to upload and apply the changes. Then relaunch the simulator. On a device, the most current version of the action deploys automatically. 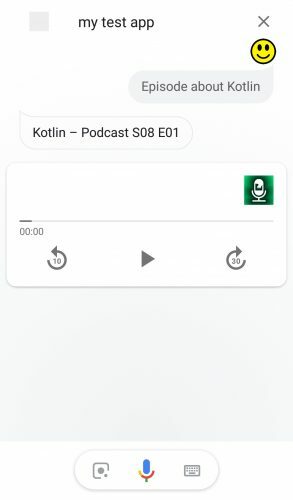 text: "Here is the latest episode"
The code creates an RSS feed Parser and uses it to connect to the podcast URL. The request is made in the form of a Promise. You can think of this like a callback. If the Promise is fulfilled, the latest item is taken from the feed and assigned to latestCast. 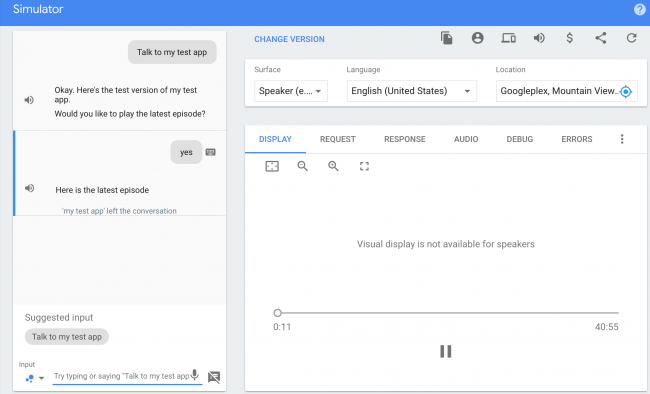 new SimpleResponse contains speech or text to show the user. new MediaObject populates with fields from latestCast, including the description, a URL to an image and the link to the audio file that is retrieved using url: latestCast['enclosure']['url']. When utilizing a MediaObject, place a SimpleResponse directly before it. 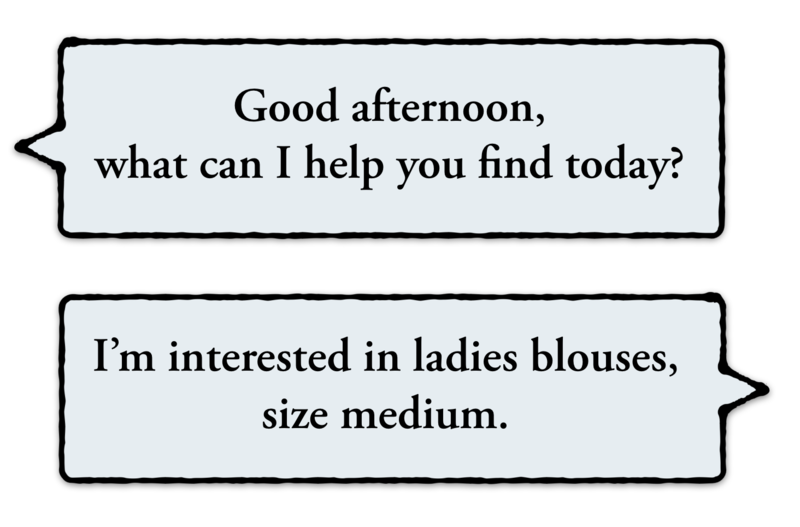 If the conversation remains open after sending a MediaObject , follow with Suggestion Chips. 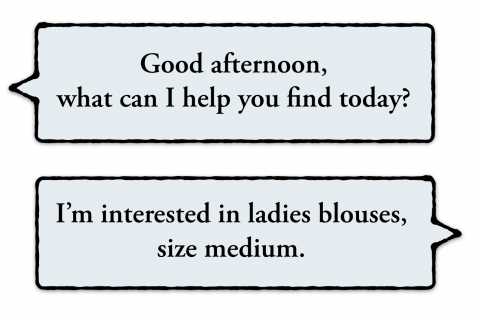 Since this example uses conv.close, Suggestion Chips aren’t necessary. You’ll see how to create them later. Unfulfilled promises prompt an error message in response. Save index.js, and in the terminal, and execute firebase deploy --only functions to deploy the changes. You can try to talk to your test app again, but you’ll get an error when trying to play the next episode. 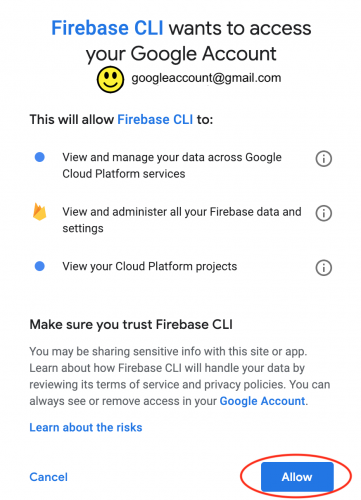 In order to do an external request, the Firebase project paired with the action must be on a billing tier other than the Free plan. Login to the Firebase Console here and select the project associated with your action. Under Development ▸ Functions ▸ Logs, you should see console.log output and error messages. The error message indicates that making an external request requires upgrading the plan first. Select Upgrade and choose the Blaze plan. The Blaze pay as you go plan does not incur a charge while testing. Now, run the test action again. When the action welcomes you, respond with Latest episode. The latest episode of the podcast should play. Notice the Media player that displays. If the current conversation doesn’t have actions.capability.SCREEN_OUTPUT and MEDIA_RESPONSE_AUDIO, the device doesn’t support media playback. The device supports audio, but it has no screen. If this is the case, ask the user whether or not to play the latest episode. This is to make the action more convenient on a hands-free, screen-free surface that relies on voice control. new Confirmation is a Helper that asks for a yes or no response. Note: The play_latest_episode_confirmation Intent in Dialogflow has an actions_intent_confirmation Event. An Event is another way to trigger an intent with predefined values such as yes or no. Find the play_latest_episode_confirmation in the Dialogflow Intents list. Enable the webhook call for this intent and Save the intent. 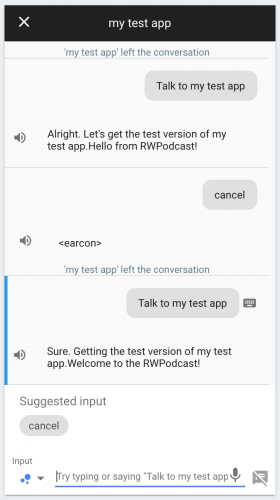 If the confirmation parameter is true, the user confirmed they want to play the podcast. You then fetch and play the episode the same way you do in the play_the_latest_episode intent. If not, the user doesn’t want to play the podcast. Prompt the user to trigger other intents. Save index.js, and in the terminal, and execute firebase deploy --only functions to deploy the changes. Open the test app in the Simulator. 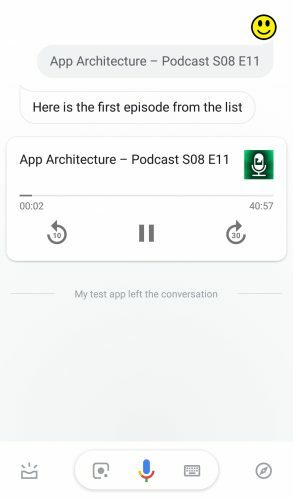 The code above creates a list that displays the three most recent podcasts. It then uses Suggestions to provide some suggestion chips. 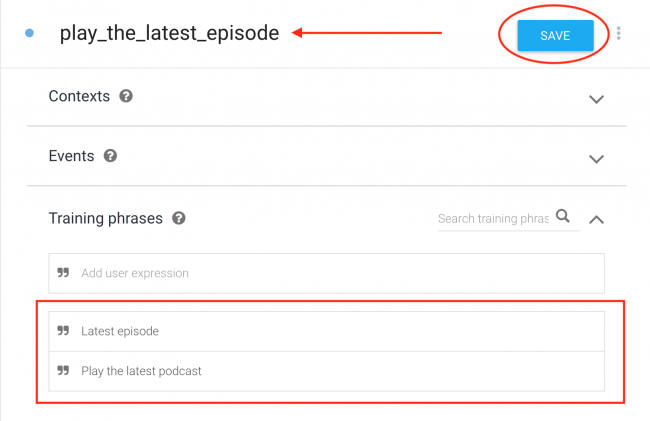 get_episode_option, which you’ll implement next, handles the event when the user selects a podcast from the list. The user may also select one of the suggestion chips required to provide after a list. Note: In Dialogflow, be sure to add actions_intent_option as an Intent and enable the web hook. text: "Here is the first episode from the list"
In the code above, the value of the option parameter is checked so the correct MediaObject can be created. It them passes the MediaObject to the conv object as a response. Save and deploy the changes. Then, test the app on a phone to see the list. When the user selects a podcast from the list, it plays. Nice, right? A Training Phrase often contains useful data such as words or phrases that specify things like quantity or date. You use Parameters to represent this information. 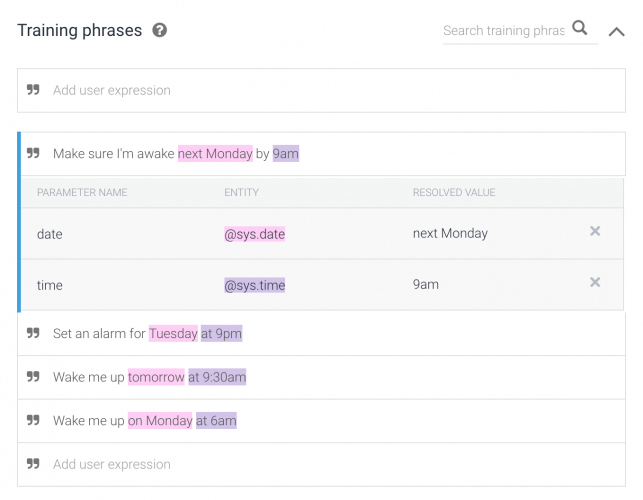 Parameters in training phrases are represented by an Entity. Entities identify and extract useful data from natural language inputs in Dialogflow. Entities extract information such as date, time, color, ordinal number and unit. The Entity Type defines the type of extracted data. Each parameter will have a corresponding Entity. For each type of entity, there can be many Entity Entries. Entries are a set of equivalent words and phrases. 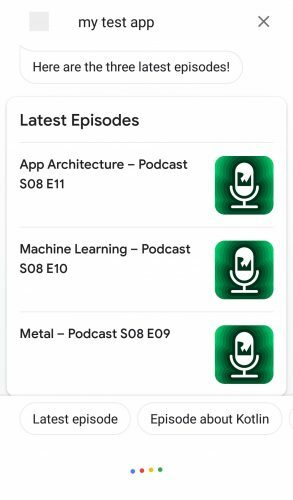 Sample entity entries for the subject of a technical podcast might be iOS, iPhone, and iPad. System Entities are built in to Dialogflow. Some system entities include date, time, airports, music artists and colors. For a generic entity type, use Sys.Any, representing any type of information. 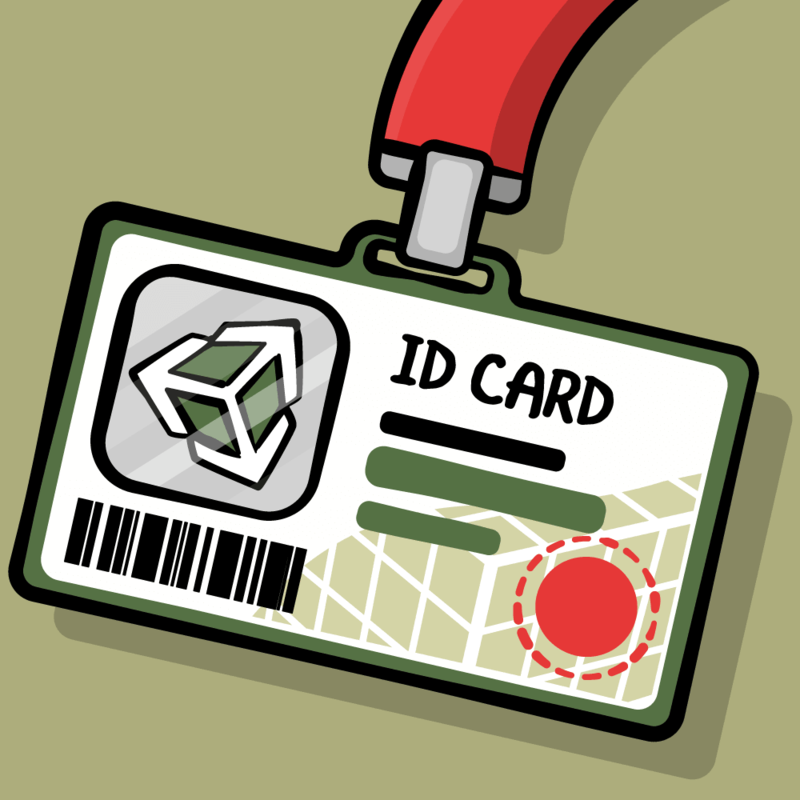 If the system entities are not specific enough, define your own Developer Entities. Below is an example of a developer entity defined to represent the subject of a technical podcast. 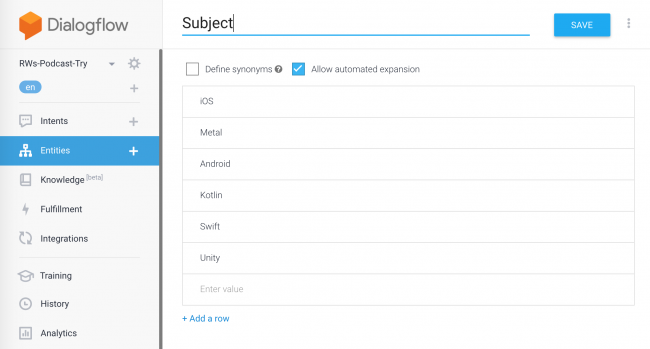 You can see the @Subject Entity created when you uploaded the sample project by selecting Entities in the left pane. A training phrase recognized as an entity is highlighted and designated a parameter, and then it appears in a table below the training phrases. Dialogflow automatically identifies and tags some more common types of system entities as parameters. 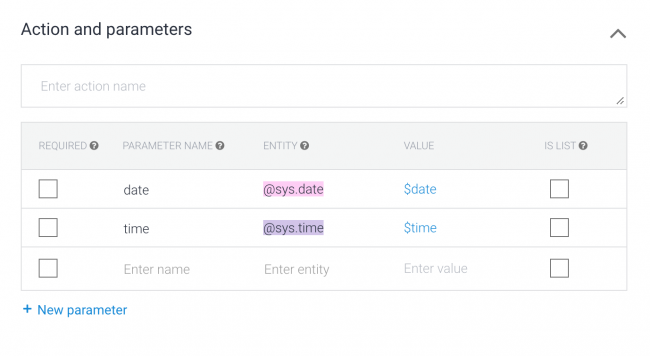 In the example below, Dialogflow identifies the time and date parameters and assigns them the correct type. You can see an example using podcast subjects be going to Intents ▸ play_an_episode_about. 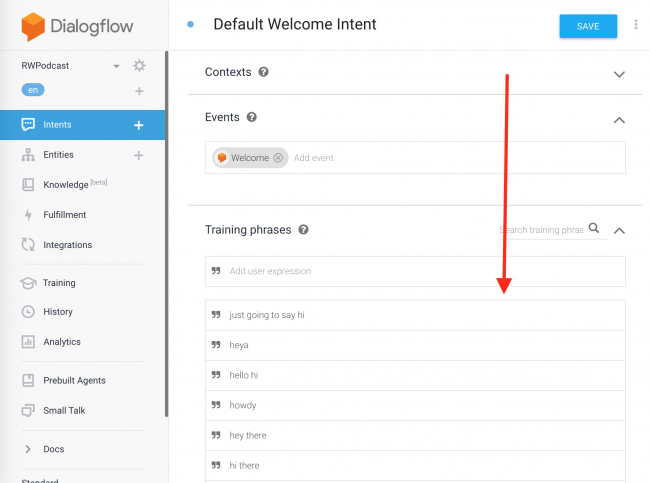 In Dialogflow, Action and Parameters are below the training phrases of an intent. A Required checkbox to determine whether the parameter is necessary. The Parameter Name identifies the parameter. The Entity or type of the parameter. The Value of the parameter refers to the parameter in responses. The code looks for the value of the Subject parameter. The user utterance provides the parameter. The Entity defined in Dialogflow provides the utterance. The first podcast containing the Subject keyword will be passed into the MediaObject and played. Wow, that was a lot of work! You’re awesome! In this tutorial, you created a Google Action in the Google Actions Console and utilized Dialogflow to design a conversation for that action. You provided fulfillment for the action by implementing a locally developed webhook in node.js, utilizing promises. You can learn more about publishing your action here. Within 24 hours of publishing your action, the Analytics section of the Actions Console will display the collected data. Use the Analytics section to perform a health check and get information about the usage, health and discovery of the action. Learn more here. Read more about the NPM rss-parser extension we used in this tutorial here. Want to go even deeper into Google assistant? Google has an extensive Conversation Design Guide. 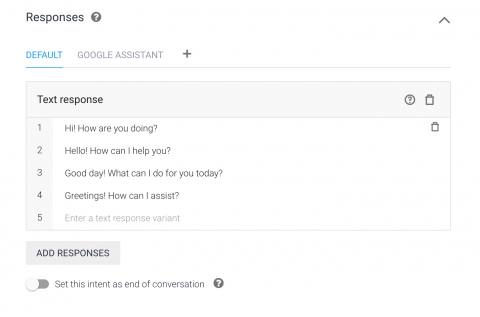 Find Google Codelabs about the Assistant here and a few Google Samples here. Google has a complete documentation.